October 16, 2014/Koilwar, Bhojpur/Patna: Villagers of Koilwar rejected Hyderabad based Ramky company's proposal for hazardous waste burning plant in Daulatpur Panchayat on the bank of Sone rivver at the public organised today Bihar State Pollution Control Board (BSPCB). Several left and socialist parties pledged to stop Koilwar from becoming a waste capital. A site visit by villagers revealed that the project is proposed in the river bed of Sone river in the vicinity of residential areas of the village in the proximity of the main road in an area of 57.24 acres. Villagers informed the Suresh Kumar Sinha, Additional District Magistrate (Upar Samaharta), Bhojpur and the BSPCB Officials, Nand Kumar and S N Jaiswal and Circle Officer, Koilwar that this project was rejected by Union Environment Ministry's Expert Appraisal Committee (EAC) in its meeting dated 8-9 November, 2012. The minutes of EAC are available on EAC's website. They raised questions about the circumstances under which this project got approval for public hearing in June 2013. Villagers like Dharmatma Sharma, co-founder of Paryawaran Swasthya Suraksha Samiti and former chief engineer, DVC and noted whistle blower A K Jain (in picture) questioned the inconsistent claims of the Ramky company about land, water and power by comparing its project with other projects. Jain said that the company has not disclosed that this site is flood prone. This can cause Bhopal Gas leak like disaster. The Court’s judgment reads: “Both older and more modern incinerators can contribute to the contamination of local soil and vegetation with dioxins and heavy metals. In several European countries, cow‟s milk from farms located in the vicinity of incinerators has been found to contain elevated levels of dioxin, in some cases above regulatory limits. Increased levels of dioxins have been found in the tissues of residents near to incinerators in the UK, Spain and Japan. At an incinerator in Finland, mercury was increased in hair of residents living in the vicinity. Children living near a modern incinerator in Spain were found to have elevated levels of urinary thioethers, a biomarker of toxic exposure. “ It notes that “After 2 years of operation of incinerator, dioxins levels were found increased by about 25% in both groups living between 0.5 to 1.5 and 3.5 to 4.0 km away (201 people) of people. In the repeat analysis, the increase was in the range of 10-15%”. Ramky's EIA report is quite misleading. It ignores the nearest schools, hospitals, CRPF camp and the Koilwar railway station. It refers to Ara railway station as the nearest railway station. BSPCB does not have the capacity to test and monitor dioxins emissions. It came to light that BSPCB is not enforcing environmental laws in the 99-125 factories from which hazardous industrial waste is generated which requires disposal and treatment at the palce of their generation. Citing these facts at the public hearing held on 16.10.2014 at Ambika Sharan Singh High School, Jamalpur, Post- Naya Mohammadpur, District- Bhojpur, the villagers said that they will pay any price to stop waste from hundreds of factories and thousands of hospitals from coming to Koilwar due to imminent public health crisis the present and future generations of residents of villages on the Babura-Koilwar road in Bhojpur, Bihar. EAC, BSPCB and District Magistrate, Bhojpur besides Bihar Human Rights Commission and R K Singh, Member of Parliament, Ara have been informed in writing about these public health and environmental concerns. Mukhiya of Daulatpur panchayat, Nand Kumar and ex-Mukhiya Prabhunath Singh and social worker Ganga Sagar Singh who were present at the venue of the public hearing raised the question of adverse health effect of the proposed plant in the 10 km radius of its location. A copy of the letter submitted to MP, Ara was shared with the ADM, Bhojpur. 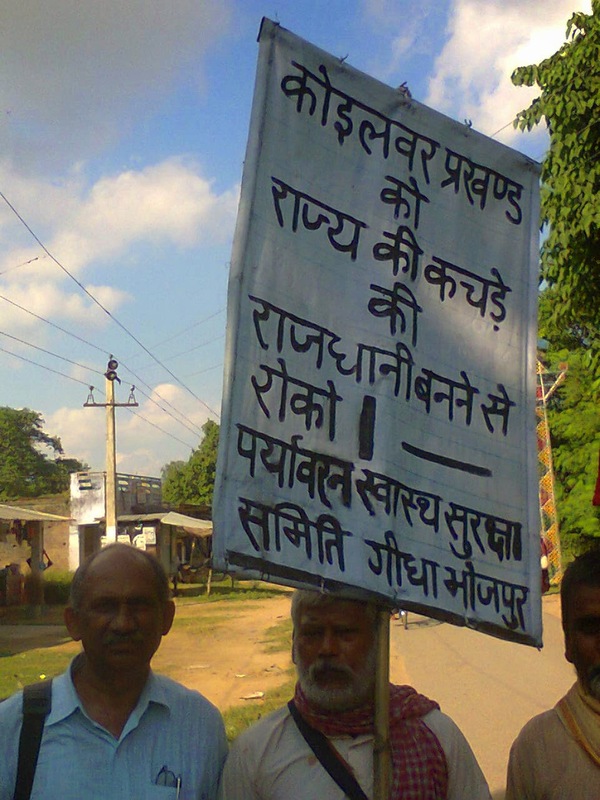 CPIML candidate for Ara in the 2014 elections, Raju Yadav expressed his party's support for the cause of saving Koilwar from becoming a dumping ground of hazardous wastes. It was apparent that there was unanimous political opposition to the Ramky's irresponsible, insensitive, anti-people, ant-environment and anti-health proposal.